I currently own a horse called Ned and a cat called Chilli! I used to have a collie called Annie and a cat called Holly, but they sadly passed away. I work at a livery yard, where I keep Ned, I look after 4-8 horses on any given day, my favourite being a Kerry Bog Pony, called Ghillie! 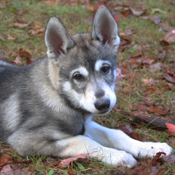 May your quest for a Tamaskan be rewarded, and if you are a worthy owner, may your dog bring you the joy and wonder my Kona has brought to me.